Whether you are a new mom or an experienced parent, finding activities for babies in NKY and Cincinnati can be challenging. It seems that there many activities for toddlers and kids, but what about things to do with babies? These little guys and gals need attention, bonding and development. And, let’s face it, mom and dad need to get out of the house! 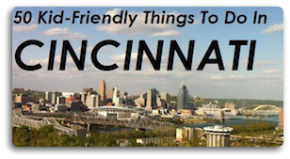 We’ve searched high and low to find some great activities and places to take your baby in Northern Kentucky and Cincinnati to learn and have a great time. Let us know your favorite class or outing with baby if we’ve missed it. Mommy and Me Make Music in Liberty Heights Preschool “is designed to promote social, cognitive, and communication skills in a fun and loving environment.” Parents and children dance, laugh, sing and listen to music together. Classes start at 4 months of age and there is even an option to have an instructor come to your house for special sessions or play groups! The Cincinnati Family Enrichment Center (CFEC) offers classes for children and babies from birth to 5 years. The class variety is amazing. Select from developmental, yoga, music & art, language (starting at 6 months) and movement classes. Check the website for details. Not only can you take classes at CFEC, but you can go to their ‘play-cafe’ open during normal operating hours and hang out in the play area or enjoy healthy eats in the play-cafe. Take a class, socialize and enjoy yourself at CFEC on Hamilton Avenue in Northside. The Little Gym offers parent and child classes beginning with infants starting at 4 months old. Get your child moving and help introduce them to colors, language development and more. Check out Gymboree in Mason at Snider Commons Play and Learn Classes for babies aged 0-5 months. Help your baby develop through Gymboree’s seven-level program consisting of sensory stimulation, problem solving and story telling. Enjoy a music class at Gymboree in Mason with your 6 month – 5 year old. Help your child develop through music, instrument play and movement. Kindermusik Cuddle and Bounce Summertime is for newborns to 12 months and allows parents and babies to strengthen bonds and communication while learning through music and movement. Check the Kindermusik schedule for more classes for your one year old or older baby. There are two Kindermusiks in our area – Maderia and Cincinnati. Please check the Kindermusik website for class schedules and details. Blue Manatee offers many classes for kids and toddlers. If you are looking for things to do with your baby, try ManaTots (0-4 years). Enjoy a story and hang out at the bookstore! Check out The Music Factory for classes for your 6 month- 18 month old. They travel to your day care or preschool to teach their classes! Babies will sing, listen and enjoy rhythm activities. They will also develop large motor skills through activities such as bouncing, tickling, clapping, singing, and dancing. Little Songbird Music Studio, with locations in Florence and Cincinnati, specializes in music education for babies, toddlers, and preschoolers and offers classes for children as young as newborn and their parents. Babies under 6 months get 4 FREE classes! A popular offering is the Musikgarten curriculum, which is a holistic approach to teaching music to children. Visit www.littlesongbirdmusic.com for a complete listing of classes. When my kids were babies, I loved going to Totter’s Otterville. I could let my older kids play in an enclosed area and the baby could take a nap, listen to a story or play in the ball pit. Check out our post on Totter’s Otterville here. Another place I loved to hang out with my babies? Reality Tuesday Cafe in Park Hills! There are tables and lounging areas with a couch, comfy chairs, and a tv that they will usually let you put on a kid friendly (aka cartoon) channel. http://www.MusicArtDance.org. – family music and baby music summer pass – come to as many classes as you want to! This is awesome. Thank you for helping out this new momma! I love all these great options for kids under 1!! !